AshleyNewell.me: Bad Pic of Reject Card and I'm Sick, AGAIN! Bad Pic of Reject Card and I'm Sick, AGAIN! Hello friends! So, I went to the doctor again yesterday after having a horrible sore throat for a few days. Turns out that I have TONSILLITIS yet again! Oy! It's never ending for me, is it? I feel awful but still have both kids to take care of and this half unpacked house. :( Can't imagine there will be much stamping going on. Ok, so here's a card I made that was rejected. What can you do? I like it, maybe it needs some ribbon or twine or something. The animals are from Lawn Fawn's Critters of the Sea. The sentiment is MFT. The paper is Echo Park from Paper Maniac. OMG girl I can't believe you are sick again! Hang in there! Love the card! Super cute! 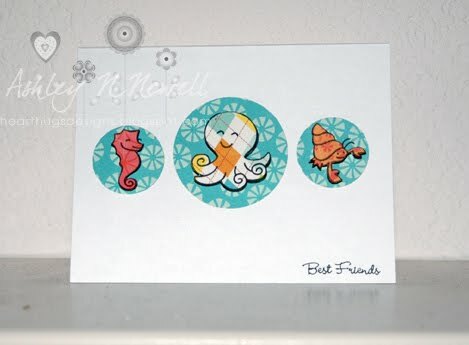 Super cute card---I really like that white space and those three circles--I don't think that it needs anything! BEAUTIFUL! This is so cute, Ashley! I love the CAS design! Sorry to hear you are sick again. BIG HUGS from Tennessee coming your way! Your card is so adorable. Sorry you feel so sick! No fun especially when you are a mommy!